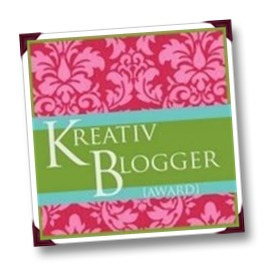 Thank you sooo much to Michelle at Callia's Corner for nominating me for the Kreativ Blogger Award!!! I learned about Michelle and her awesome blog through The Weekly Chase posts. I make sure to visit her blog on a daily basis now! So thanks again!!! I'm so honored!!! So here we go with 7 things about myself! Hopefully you are not too bored lol! 1. I have 4 brothers and 2 sisters! Nope....they are not my true brothers and sisters...1 brother is my half brother and the rest are all step siblings. But we all treat each other as if we are true brothers and sisters. This is a picture of me with my brother Byron and sisters Christy and Amy! 2. I've probably said this a million times but I am a horrible cook! It's probably due to the fact that I hate cooking! I LOVE to eat but don't want to cook it. So in my household my hubby does most of the cooking and I clean...which I don't mind at all! 3. I am a currently unemployed teacher. I taught third grade for two years before quitting to start my family. After my second son was born, I started working as an aide at my church's Mom's Day Out Program. I worked my way up to be a PreK 3 teacher...which I did for 3 years. This coming school year I am starting a new path in my career. I am going to substitute teach until I can find another teaching job in the public school system. 4. I've only been running for about 2.5 years. 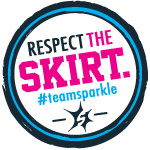 I've completed several 5K's and 10K's, 9 half marathons, and 1 full marathon. So if I can do it you can too!!! 5. I met my husband on the way to a Garth Brooks concert. Me and my friend rode with him and his friend to the concert. He didn't talk to me at all that night. Then the next year my friend's boyfriend hooked us up. My husband told the pastor during our pre-wedding counseling that something told him at that concert that I was the girl he was going to marry! 6. When I was eighteen I had to have surgery to remove an ovarian cyst that was the size of a football. I lost that ovary and half of the Fallopian tube on that side. But I was still blessed with two healthy boys! 7. And last but not least...I've had several nicknames growing up...Mindy Moo Cow (which I was never fond of), Pooh Bear (my daddy still calls me this), and Minnie Mouse. I am nominating the following people for this award. Please go check out their blogs! QOTD: Tell me one random thing about yourself!